Washington: A small group of Sikh separatists held a protest in front of the Indian Embassy in Washington during which they tried to burn the tricolour on the Republic Day, a move slammed by local Sikh community. 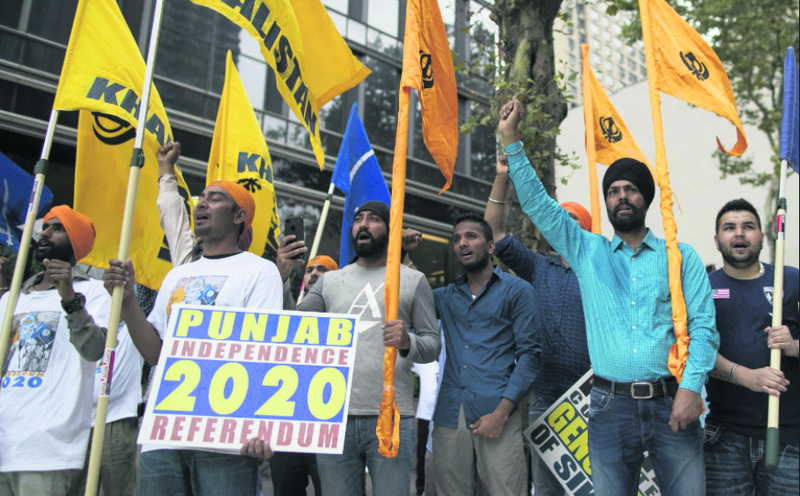 Organized by New York-based Sikhs for Justice (SFJ), the protesters raised "Khalistan Zindabad" slogans and tried to burn the Indian flag in presence of the local Pakistani media. However, the SFJ supporters were outnumbered by Indian-Americans raising Vande Mataram and Bharat Mata Ki Jai slogans with Indian flags flying high in their hand. With passions running high between Indian-Americans and protesters, local law enforcement officials had warned against any attempt to burn the Indian flag. In fact, they sought additional security personnel as the standoff continued. A group of mounted police were seen standing a few blocks away. It was some tense moments for the local law enforcement officials as the two groups were standing face-to-face in a park just across the road from the Indian embassy in Washington. The standoff lasted for about two hours after which the protesters were forced by the local police to move across the road. "Such theatrical protests like flag burning are detrimental to the peace loving and harmony enhancing Sikh community everywhere," Jasse Singh and Kamaljit Singh Soni, the chairman and the president, respectively, of the Sikhs of America said in a joint statement. "I am disturbed and concerned that a chosen few can build a narrative about the Sikh community in USA which will be viewed by the whole world," said Puneet Ahluwalia, an Indian American leader from Virginia. "I will not stand for these forces to develop a misguided narrative with US leadership and public, besides polarizing the already sensitivities towards minorities in India," he said. In a statement, American Hindu Coalition (AHC) expressed deep dismay at SFJ's attempt to burn the Indian flag. "The intent of flag burning is also an immense affront to the largest democracy on the earth and causing huge grief to American Hindus," said Harsh Sethi, the AHC president, who has a Sikh inheritance. Ravi Batra, an Indian-American attorney from NY, too expressed his concern. "What SFJ - an American-born and accredited entity is seeking to do, however - is to burn the flag of another nation - and here is the critical part - as part of a campaign, allegedly, as an unregistered foreign agent engaging in terrorist activities in India," Batra noted. Meanwhile, the Twitter account of the SFJ has been suspended by the social media company. "Twitter suspends accounts which violate the Twitter Rules," meaning, Twitter probably has suspended the account for running hate campaign against India.